Steven Bassett’s petition to the White House. For more commentary on this, please read Lee Spiegle’s Huffington Post article HERE. The Citizen Hearing on Disclosure (CHD) (http://www.citizenhearing.org/) was held April 29 – May 3, 2013 in Washington D.C. I attended the CHD as a guest of my medical colleague and friend, Dr. Jesse A. Marcel, Jr. Dr. Marcel had been invited to speak about his involvement in the 1947 “Roswell Incident”. Another individual who was invited to speak at the CHD was previous Peruvian Air Force fighter pilot Oscar Santa Maria Huertas. 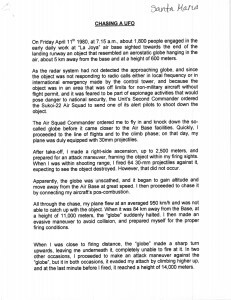 Mr. Huertas brought with him a typed statement, shown below, describing his Friday, April 11, 1980 military encounter with a radar -invisible “globe” UFO. A copy of his statement was given to each of the CHD panel members (each a previous member of U.S. Congress) who were there to listen to the testimony of the 40 witnesses, to ask questions of those witnesses, and to, ultimately, formulate a response that would prompt a formal hearing by sitting members of Congress. That hasn’t happened, and the denial continues. I asked Mr. Huerta for my own copy of his statement, which he kindly provided to me. I asked him to sign the statement, which he did. The writing you see below Huertas’ signature is my writing, a note that I made after speaking with Mr. Huertas about his harrowing experience. Huertas’ statement is shown here, below. Because these scanned reproductions of Huertas’ document are so small (for some reason this program will not allow me to enlarge them further) I have transcribed Huertas’ statement, below document #2. Mr. Huertas’ primary language is Spanish, therefore there are some misspellings and incorrect punctuations in his statement. These have all been included in my transcription of his statement for the sake of accuracy. Page 2 of Huertas’ CHD testimony. 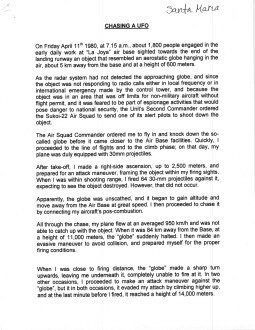 On Friday April 11th 1980, at 7.15 a.m., about 1,800 people engaged in the early daily work at “La Joya” air base sighted towards the end of the landing runway an object that resembled an aerostatic globe hanging in the air, about 5 km away from the base and at a height of 600 meters. As the radar system had not detected the approaching globe, and since the object was not responding to radio calls either in local frequency or in international emergency made by the control tower, and because the object was in an area that was off limits for non-military aircraft without flight permit, and it was feared to be part of espionage activities that would pose danger to national security, the Unit’s Second Commander ordered the Sukoi-22 Air Squad to send one of its alert pilots to shoot down the object. The Air Squad Commander ordered me to fly in and knock down the so-called globe before it came closer to the Air Base facilities. Quickly, I proceeded to the line of flights and to the climb phase; on that day my plane was duly equipped with 30mm projectiles. After take-off, I made a right-side ascension, up to 2,500 meters, and prepared for an attack maneuver, framing the object within my firing sights. When I was within shooting range, I fired 64 30mm projectiles against it, expecting to see the object destroyed. However, that did not occur. 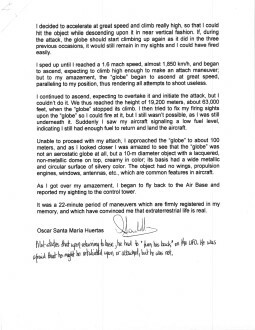 Apparently, the globe was unscathed, and it began to gain altitude and move away from the Air Base at great speed. I then proceeded to chase it by connecting my aircraft’s pos-combustion. All through the chase, my plane flew at an averaged 950km/h and was not able to catch up with the object. When it was 84 km away from the Base, at a height of 11,000 meters, the “globe” suddenly halted. I then made an evasive maneuver to avoid collision, and prepared myself for the proper firing conditions. When I was close to firing distance, the “globe” made a sharp turn upwards, leaving me underneath it, completely unable to fire at it. In two other occasions, I proceeded to make an attack maneuver against the “globe”, but it in both occasions, it evaded my attach by climbing higher up, and at the last minute before I fired, it reached a height of 14,000 meters. 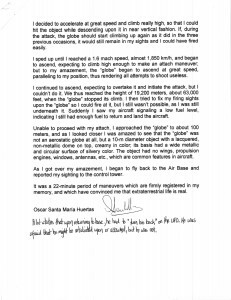 I decided to accelerate at great speed and climb really high, so that I could hit the object while descending upon it in a near vertical fashion. If, during the attack, the globe should start climbing up again as it did in the three previous occasions, it would still remain in my sights and I could have fired easily. I sped up until I reached a 1.6 mach speed, almost 1,850 km/h, and began to ascend, expecting to climb high enough to make an attach maneuver; but to my amazement, the “globe” began to ascend at great speed, paralleling to my position, thus rendering all attempts to shoot useless. I continued to ascend, expecting to overtake it and initiate the attack, but I couldn’t do it. We thus reached the height of 19,200 meters, about 63,000 feet, when the “globe” stopped its climb. I then tried to fix my firing sights upon the “globe” so I could fire at it, but I still wasn’t possible, as I was still underneath it. Suddenly I saw my aircraft signaling a low fuel level, indicating I still had enough fuel to return and land the aircraft. Unable to proceed with my attach, I approached the “globe” to about 100 meters, and as I looked closer I was amazed to see that the “globe” was not an aerostatic globe at all, but a 10-m diameter object with a lacquered, non-metallic dome on top, creamy in color; its basis had a wide metallic and circular surface of silvery color. The object had no wings, propulsion engines, windows, antennas, etc., which are common features in aircraft. As I got over my amazement, I began to fly back to the Air Base and reported my sighting to the control tower. It was a 22-minute period of maneuvers which are firmly registered in my memory, and which have convinced me that extraterrestrial life is real. I sincerely hope that an event like this never happens again, but I know it has happened at least once before. We have USAF fighter pilot Milton Torres to thank for having the courage and the integrity to come forward and inform us of a similar event, in 1957, that involved him. Apparently, for at least 23 years, there was no international agreement (U.N., where were/are you on this?) that the militaries of every nation on Earth should and would avoid hostile action towards extraterrestrial UFOs. In fact, from these two stories we can surmise that at least our own U.S. military, and that of Peru, were intent upon shooting down a UFO (that we are told do not exist), presumably in the interest of “national security”, but more likely with the hope of recovering advanced ET technology that would then be “back-engineered” to gain a competitive edge over “our adversaries”, real or imagined, existing in the mindset of our now bloated, out-of-control military-industrial complex. President Eisenhower knew about this and he warned us about this evolving scenario a long time ago, but today we remain so preoccupied with the necessities of life, scratching out a living, that we continue to ignore his message. So, what is the present day policy addressing how our U.S. military is to respond to an extraterrestrial UFO “invading” (or simply observing) protected U.S. airspace? We have no way of knowing this, because we have not yet even come to agreement among ourselves, despite the existence of a great deal of evidence, that extraterrestrial UFOs even exist. We are still being told by the Obama administration that they do not exist, even as recently as 2011. In my opinion we all have a right to know what is happening, and we should all have a voice in how our relationship with these Star Visitors evolves. But, we have been deliberately excluded from the policy loop, and this strategy was originally inculcated by President Truman and the group that was designated as Majestic 12 (http://www.majesticdocuments.com/) . We remain disenfranchised from the UFO as a result of Truman’s “you can’t tell the people” UFO policy to this day, one that has sustained itself and grown into what we see today – the military-industrial complex that Ike warned us about. I cannot speak for you, but I respect and I value all of the blood, sweat, and tears that have been invested by humanity, poured forth over tens of thousands of years by billions of human lives, that have carried human civilization forward to this point in time. In my opinion, it is a mistake to presume that the ET civilizations arriving here are hostile, that they will continue to show patience with the human race indefinitely, or that they do not have the technology (read “firepower”) that could one day be trained upon us should we continue on in our ignorant and intransigent denial of our situation, pretending to be the self-perceived “Masters of the Universe”. Certainly, this we are not, and all militaries would be well advised to remember what we truly are – a nascent civilization only beginning to fathom what is “out there”. Until we have a solid grasp of who and what we are dealing with relative to the ET civilizations arriving here, it would seem that some humility, some respect, and a genuine desire to learn what they may be willing to teach us would be the order of the day. Human beings hold our intelligence in high regard. Let’s try to show some. Thanks for reading. Please share this post on Facebook , Twitter, and any other social media you use.